The Music Ends… | brainsnorts inc. If you’re lucky, you know Frank. 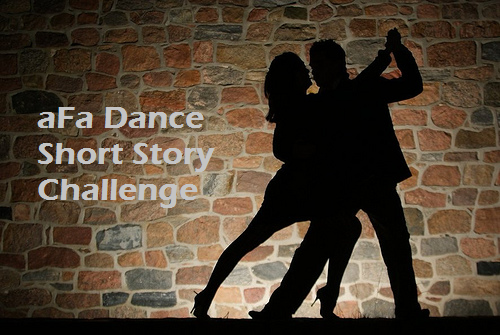 If you pay attention, you may have seen his short story about two dancers, one dance. After posting his story, he invited others to add their own ending. His story ends where “the music ends.” You’ll see it in red text. Readers were asked to add their own 75-word ending. Those are my 75 words in blue at the end. He rolls her out – they flick in unison. He tugs to rolls her back into his arms. She shrugs him off by returning to hold with her head turned away. Their steps continue. His right hand releases her left. He pulls his arm from her waist. She doesn’t need to stay close, but she does, smiling. “But what about…” she starts. “When you said you wanted one more dance, I thought…” Her mouth stops. Her eyes say more. “Never mind.” Her smile fades. Mr. Lidge walks away, followed only by the eyes of the former Mrs. Lidge. Thanks for taking the time to do this as I especially appreciate the participation of the writers in the crowd. I hope you noticed that I did take your suggestion of how I used “naturally”. You are the first to use the divorce take, although several others (at least Amy & Dale) did incorporate a twist with relationships. i invite your readers to come over to read the readings & comment … and heck, they are welcome to participate as well. sure is. thanks very much for stopping by. Such a fun way aFrank gets people thinking of alternative endings. I enjoyed your ending very much. thanks very much. i appreciate that you took the time to read and share your thoughts. This story is well done. Don’t ever worry about writing a theme that someone else has done. They may be ‘the same’, but they’re always ‘different’. I try to write a 100 word Flash Fiction each week, and never read any others except the hostess, until I’m either successful, or have decided I can’t. is the flash fiction you’re doing the Friday Fictioneers? I used to participate in that. was very helpful for editing and revising. thanks for the nice words and thanks for sharing your thoughts. about two years ago i was writing there for about the same percentage as you, but i stopped for several reasons. 1. i was a little bothered by how many people didn’t really read or comment on each other’s work but mainly just posted a link to their own story in your comments. 2. i wasn’t thrilled about how many people had stories posted literally within minutes of when rochelle posted the picture. i wanted people to take more time, put more effort into what they were writing instead of just wanting to be first in line. 3. not everyone was as receptive to feedback as i think they should be. i liked to read and give genuine feedback, point out areas where the story could be edited, maybe save a few extra words that could have been used elsewhere for more detail, but some people only wanted to hear “great job.” and if i didn’t give them what they wanted, they certainly let me know it. that kind of killed my drive for participation. however, i can’t deny it helped me do better with my own editing. Rich … I hope you read Archon’s (on his blog) … gotta love it! PS: Critique time … were my revisions an improvement from the original? Yep … rolls should be roll. Damn!! !